(CS/mas) A Luxembourg platform calling for plans for a US-EU trade partnership to be abandoned has urged the Grand Duchy’s MEPs to vote against the proposals put forward by the European Commission. The Stop TTIP platform is a partnership between 17 organisations in Luxembourg, including labour unions and NGOs, such as Caritas, Greenpeace, natur & ëmwelt and the Mouvement Écologique. Together, they are campaigning against the Transatlantic Trade and Investment Partnership, which supporters argue would open the US to European firms, encourage exports and help boost the EU economy, while at the same time protecting the bloc’s high standards in health, safety and the environment. However, it is precisely the latter point, which opponents of TTIP are concerned about, as health and safety standards between the US and the EU vary greatly, for example in relation to food. Investor-State Dispute Settlements, which allow companies to sue governments if they are negatively affected by policy-making, are another contentious issue. 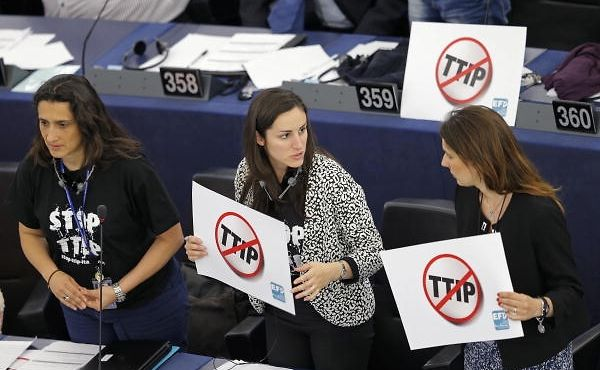 Additionally, TTIP opponents have expressed anger at the way the negotiations are being led. While the Commission itself has said that an unprecedented amount of material is available on consult to the general public, there has been criticism that the talks are being led behind closed doors, with not even the EU’s member states fully in the know of the details. Prime Minister Xavier Bettel earlier this year commented that TTIP should be brought out of its darkroom and to a wider public debate. The Luxembourg government is not fundamentally opposed to TTIP, but has said that European values should not be thrown overboard for it. Talks will continue under the Luxembourg EU presidency. A vote at the European Parliament on TTIP meanwhile was postponed last week. While the vote would not have been binding, it would have sent a strong signal to the Commission negotiators. MEPs had submitted some 116 amendments to the trade deal as it currently stands. Luxembourg MEPs have now been called on by the anti-TTIP platform to distance themselves from the project and vote against it when it comes back on the agenda. The group also criticised that only two out of six MEPs, Georges Bach (CSV) and Claude Turmes (déi Gréng), were present at last week’s session. Some two million signatures have been collected across the EU against the trade deal.